The six-year-old was purchased with the marathon contest in mind, and that vision proved spot on as he galloped on strongly up the hill to land the spoils in the €40,000 contest. School Lane made a brave bid from the front in the three-and-a-half-mile event, but could offer no more when claimed by Amaulino on the run-in as he swooped under Andrew Ring for a three-and-a-half-length win. The 8/1 winner was following up a success at Leopardstown earlier in the month when he had beaten the same rival. The trainer's son, Marshall Watson, said: "We bought the horse initially from Colin Bowe, with this race in mind. "Leopardstown's win took me completely by surprise. 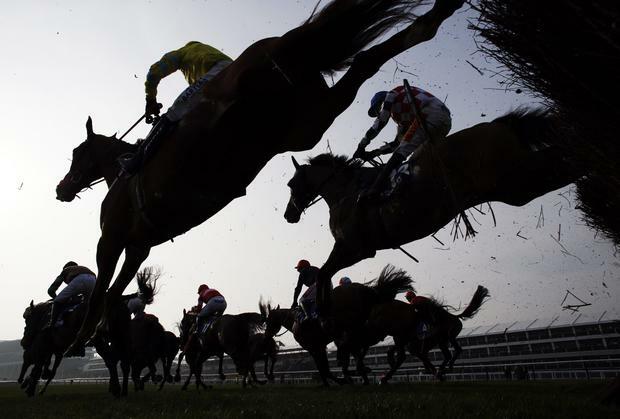 "I would say what we will do is go to Aintree for the race before the National as a big day out, and then put him away for something like the Midlands National in Kilbeggan. "It's brilliant for (joint-owner) Jim Matthews, who has been such a big supporter of ours." Michael Verney Paul Nicholls is already eyeing another significant career landmark as a trainer after a spectacular season was capped with his 3,000th jumps winner on British soil at Cheltenham yesterday. Michael Verney Skardu parachuted his way into the English 2,000 Guineas picture by maintaining his unbeaten streak when coming home strongly to land the Craven Stakes at Newmarket yesterday.